Jeanne started her Reiki practice in Santa Clarita, California where she had a Reiki Center for 18 years. She recently moved to the Phoenix Arizona area where she has been Spiritually guided to continue to serve others with her Reiki and Spiritual practices. She now has a Reiki Practice in Sun City Arizona where she continues to offer personal Reiki Sessions and teaches all levels of Reiki Classes, other Spiritual classes and Readings. Jeanne is able to do distant Reiki healings for anyone from all around the world. She also gives Angel Card Readings, Mediumship Readings and Spiritual Counseling via telephone from all over the world. Jeanne incorporates crystal healing into her Reiki sessions and is a Level 3 Crystal Energist ™ and has a Certification from the Crystal Energist ™ Practitioner Program. She feels blessed to communicate through Clairvoyance, Clairsentience, Clairaudient and Claircognizance with the Angelic Realm and Ascended Masters and Light beings. She have been practicing meditation for over 28 years and is a Certified Level One and Level Two Practitioner of The Melchizedek Method. She is an Ordained Minister by the Universal Life Church. 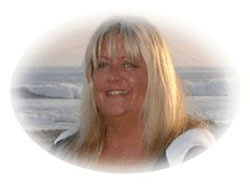 Jeanne is a Certified Medium, Certified Angel Card Reader, Usui Reiki Master Teacher and Karuna Reiki Master Teacher. She teaches All levels of Usui Reiki classes, Certified Mediumship classes, Telepathic Communication Classes, Certified Angel Classes, Channeling Classes and gives personal Reiki & Crystal sessions, Angel Card Readings, Mediumship readings and Spiritual Counseling. She sells a large amount of Crystals, Meditation CD's, Reiki Manuals, Angel Mist Lavender Spray for clearing out energy and upgrading and Sage. She also offers Meditation Classes throughout the month. Once a month the students of Angels Touch Reiki meet together to give each other Reiki sessions so that all the practitioners stay centered so they can continue to do the wonderful healing work that they came here to do.